Wow!!! This is the first YA romantic thriller I have ever read and I must say it is creepy good. Emphasis on CREEPY! The alternating point of view gives an intimate look not only inside a demented killers mind but also into the strange new death visions Eva encounters following waking up in the hospital. 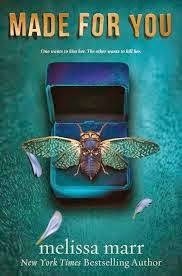 I loved the slight paranormal twist to this dark and otherwise disturbingly realistic novel of obsession turned deadly. The inner ramblings of "Judge" are chilling as we find out just exactly how crazy he truly is. I also really enjoyed the fact that amongst the suspenseful tale of a murderer was also a rekindling romance to root for. The silver lining I guess you could say. Of course this only drove the killer even more mad but still it added some softness to this captivating whodunit. I felt slightly "obsessed" while reading Made For You. It's haunting story pulling me in page after page. I was racking my brain trying to figure out who "Judge" was. If you are a fan of intense YA novels with lots of suspense then this is the book for you!